Pairing the classic gameplay of Words With Friends with the top features requested from the Words With Friends player community, Zynga has just launched the all new ‘Words With Friends 2’ to global audiences. The next-generation take on the world’s most popular mobile word game, which is now available in the App Store as a free download, features engaging new features inspired by eight years of the original Words With Friends. Words With Friends 2 brings an all new AI bot-powered Solo Challenge, team versus team Lightning Round and enhanced Social Dictionary. 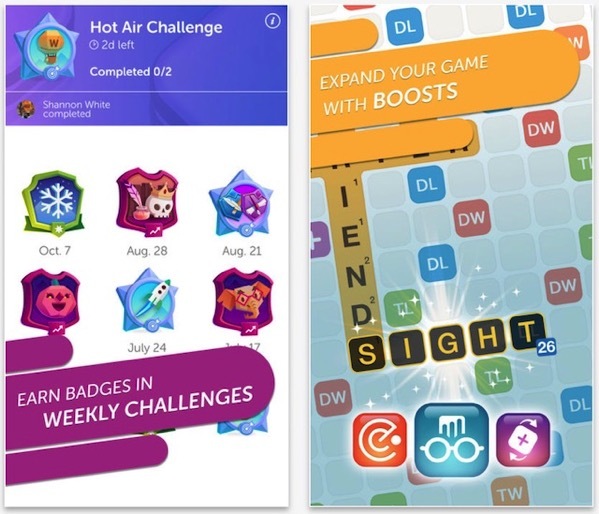 “Words With Friends 2 honors the rich, pop-culture legacy and beloved social gameplay of Words With Friends, while introducing innovative features in the largest refresh in the game’s eight-year history”, said Bernard Kim, President of Publishing, Zynga. Solo Challenge: Powered by the latest AI technology, WordMaster bots help players develop their strategic skills by advancing through a ladder of increasingly tough matches. Through rapid, real-time gameplay, Solo Challenge features a personalized playing experience, ensuring wordies are properly challenged in the ultimate battle of man versus machine. Lightning Round: A first-ever synchronous multiplayer feature, Lightning Round introduces a brand-new way to experience the beloved gameplay of Words With Friends faster and more competitive than ever before. For the first time ever in Words With Friends, players will be able to play against more than one person in the same match by joining teams of five in a rapid-fire wordplay faceoff. Boosts: From previewing all possible tile placements in Word Radar to uncovering the best word choice after you’ve made your move with Hindsight, the boosts in Words With Friends 2 are designed to continually build gameplay strategy and vocabulary, helping even the most accomplished player increase their word score. Social Dictionary: Inspired by the over 5,000 new word requests submitted by players every day, Words With Friends recently launched the Social Dictionary, adding more than 50,000 new words in-game. Words With Friends 2 enhances the Social Dictionary with in-depth stats allowing players to see how they match up against opponents and the rest of the wordie community in mastering the newest Social Dictionary additions.